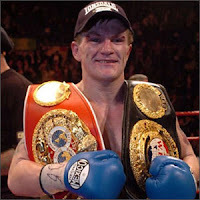 Ricky Hatton says he will fight twice more before retiring from the sport. Hatton will fight Paulie Malignaggi later this year in Las Vegas for the IBO and IBF light-welterweight title. The Manchester boxer, 29, then plans to end his career against Filipino great Manny Pacquiao or Mexican Oscar de la Hoya at Wembley next year. "I don't want to go on forever and would have done everything I dreamed off, so two more fights and then I think I'm done," Hatton told BBC Sport. Hatton confirmed that his fight against American Malignaggi would be in Las Vegas, the scene of his only defeat, against Floyd Mayweather in December. "I'll fight Paulie Malignaggi in November in Las Vegas again, so I'll be able to take my wonderful fans over there again and if I win that, then it'll be my eighth world title," he said. A showdown with Pacquiao, who claimed the WBC lightweight title with victory over David Diaz on Saturday, would pit two of the most popular boxers in the sport against each other. Both Hatton and Pacquiao have a huge following and the fight, which the 'Hitman' hopes to hold in front of 100,000 fans in Britain, would prove a fitting finale to his career. "In the New Year I'm hoping to fight either Manny Pacquiao or Oscar de la Hoya at Wembley Stadium in front of 100,000 people and after that I'll probably retire," added Hatton.